In a dutch oven, place your pork and coat with seasoning on all sides until completely covered. Drizzle oil over the pork. Cover dutch oven and bake in preheated oven for 1.5 to 2 hours until completely cooked. Allow to cool on a large cutting board. When cooled, shred or chop up the pork into bite sized pieces. 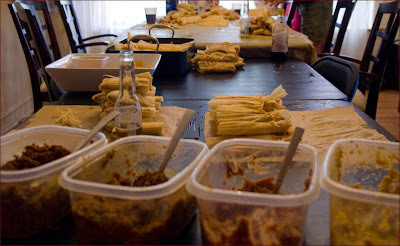 Place in a bowl, cover and chill until ready to fill tamales.